Dr Martens: a brand synonymous with self-expression, rebellion and Brit youth culture. It was no wonder then, when the music heritage footwear company were looking for a new flagship location, it had to be Camden; and it had to be LOOKLOOK. London’s Camden area is famous for markets, the Camden Locks and great music. With this backdrop the retail space had a lot to live up to! And the space is really packing a punch; with a dedicated gig space putting on regular nights, a GIF booth to capture all the fun and increase brand awareness and footfall, and a full personalisation station to help achieve that elusive pair of bespoke DM’s, there’s a lot for customers to do. The store is home to a gig space called The Boot Room which plays host to live performances with top DJ’s from Mixclouds books. “Dr. Martens has a long-standing relationship with music and the creative communities, so having an area which fans can access and use to showcase their talent will be a really positive thing – especially to London’s music venue scene which is under ever-increasing pressure of closure. We very much see this exciting new store becoming a cultural hub for the brand, its fans and Camden.” said A Dr Martens spokesperson. The brand were keen to bring their flair for innovation to the storefront with a GIF booth for making and sharing instant GIF’s from LOOKLOOK. Easy for customers to make hilarious GIF’s and a superslick user-journey for customers to share the brand’s retail message through the hashtag #drmartensstyle, it was a no brainer for the innovative footwear brand. There’s also a specific area for customising and personalising their products. You can also bring in your old DM’s to be upgraded with some customisation and look out for special edition hand painted boots specific to that store. 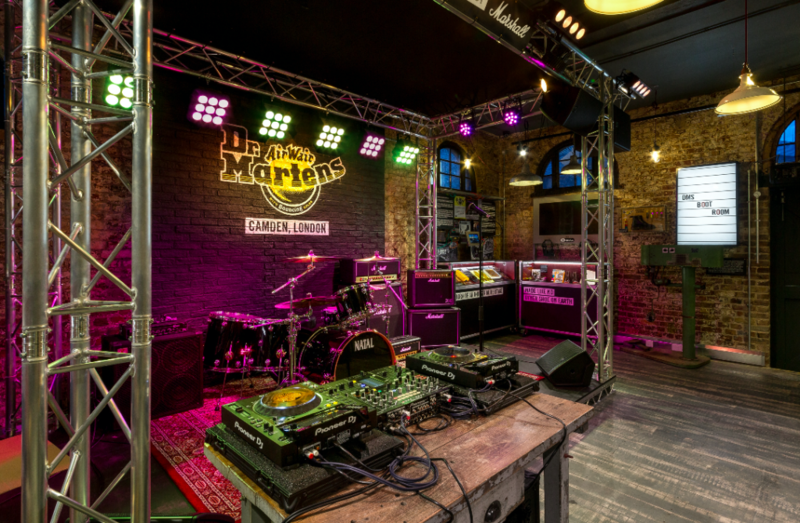 “By opening a store in Camden Market it allows Dr. Martens to have a conversation with both our local and international fans against the backdrop of the alternative and vibrant community of Camden. It also positions the brand in its rightful home – an area steeped in authenticity and musical heritage,” a DM’s spokesperson said. In the two months since GIFGIF has been in store we’ve seen literally thousands of GIF’s made, with Brand Engagement Opportunities (people viewing the GIF) well exceeding 50,000. This new style of store is part of a trend we are seeing where brands are embracing the experiential side by providing a more welcoming home environment where customers feel like close friends.